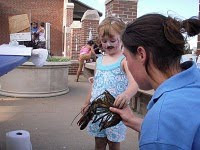 Last night, July 22nd at Carson Beach, there was first Family Fun Night held by the South Boston Neighborhood House. 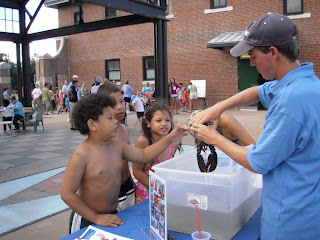 Save the Harbor staff Dan, Carolyn, and Tom Reagan went to teach the youth with the touch tank. Earlier in the day Dan and Carolyn had been lucky enough to catch two lobsters! The kids eyes widened as saw the massive lobsters come out of the tank. The weather was gorgeous. They really enjoyed the beautiful weather and had a great time. The organizers did a fantastic job. The families even signed a poster thanking Save the Harbor/Save the Bay!